I have had my difficulties recently dealing with a Government department, HMRC. A current trend in an era of cuts is to sweep away those employees who are regarded as expensive, which means the loss of many middle-management jobs. Now, I would not argue that there can be a problem in having lots of people overseeing rather than doing, but an efficient management structure requires communication; that is the cornerstone of an efficient business. If there is just an elite of senior management that means that those at the coal face doing the work, whether it is in manufacturing or services, have to just follow instructions to the letter. There will be no conduit to report problems and to suggest better ways of doing things. At one time it seemed we had moved away from the feudalist “them and us” environment which existed into the seventies, and even in very large businesses there did seem to be an era of listening to the grass roots in a business, feeding information up and making changes. Now many of the cuts we are seeing in the Civil Service and in the Banks for example are again sweeping away the middle management and the good communicators along with the dead wood. These changes are not just those coming in the era of a new Government; the process has been going on for several years. It seems to be the theory that the human communicators can be replaced by technology. However, unless the middle management can be entirely substituted with sentient androids it is a strategy which will lead to failure. In small business we understand better that we should give ownership of their jobs to our employees because in that way our businesses will be more successful as well as encouraging loyalty of our employees in particular, all the staff to each other, and of course and most importantly, the loyalty of our clients and customers to our business and our brand. We are all in it together. To me, responsibility plus loyalty equals efficiency and success, and success equals prosperity. It is all rooted in our relationships within the business. On the local news on TV there was a feature from a seaside town about the high level of unemployment. One guy interviewed complained he couldn’t get a job despite being a qualified bricklayer, gym instructor and IT technician. Now I know there is something known as a benefits trap and there may not be that many full time jobs in those disciplines, but a few postcards in newsagents’ windows would surely bring some work in any of these areas of expertise. It would also show continuing experience for a prospective employer when the jobs market picks up. If the guy were lucky his bits of work from the three areas could add up to a full-time occupation. It certainly sounds like a waste of talent. Am I being harsh? Is this another example of the dependency culture? Should he be on his bike? I am a great believer in getting out and talking to other people in business. I go to networking meetings, I go to seminars and I am a member of several business groups where we may have an outside speaker. I am always willing to learn. I also like to cooperate with others in marketing, which may be through networking or it may be through a particular initiative. One of the biggest frustrations in getting cooperative projects off the ground may be a lack of commitment from the start and down the line from people who say they want to be part of an exciting new idea. Either these people think that paying their money is enough, and it is up to other team members to do or the work, or they have a problem with paying to commit and be there when it counts. I don’t know the answer to this. Part of the pleasure of running a business for me is having the money flow in, not just because money is a handy thing to have, but because it is an indication of success and achievement. Success is good for our egos and well-being. Are the uncommitted crowd people who have a lot money and are playing at running their businesses? Are they lazy? Should they be in business at all? Would they be better off having a job and being told what to do? I believe in putting my money where my mouth is and being committed, because it is rewarding being a sometime team player; running one’s own business can sometimes be lonely. Should we not all be doers rather than just talking the talk? I have been writing recently about making assumptions about our business and our clients which may be unwarranted. In the business process, whether we are selling goods or services, we do need to understand those who may buy from us, and what they are looking for when they do buy, whether from us or our competitors. That means that research is essential to ensure that we do know what we are talking about. Of course we will still not know what we don’t know, but the more we do know by asking the right questions, the better position we will be in to meet the expectations of our market, or to be specific, our customers and prospects, because they all have their individual needs. So as long as we are prepared to keep testing our marketing strategy and our business approach, then we are probably doing our best, but no complacency is allowed! We should always listen to our peers and colleagues of course; it is essential. They have a collective knowledge which is a huge resource. Of course, we may not always get the right advice, though, and sometimes our own experience may tell us more than what we hear from our friends and colleagues. Recently, someone said that blogging was not very effective in marketing. Well, I wouldn’t say that blogging should be the only marketing we do, but I know from personal experience that it works for me; it does bring in significant new business and that is a big plus for me because at the same time I really enjoy the writing. We should always listen to advice freely offered, and often we should take paid-for professional advice on marketing and other strategies. However, if we already know that something works for us we should stick to our guns; if someone thinks it shouldn’t work they may not understand our niche. I believe in always listening but being confident in what we believe works for us. Every business is unique and needs its own strategies to take it forward. I am back to one of my favourite subjects, but I make no apology. If you belong to referral networking group you have to turn up almost all the time. That’s how it works. You have to be seen, you have to communicate, you have to be trusted, and then your peers in the group will feel able to trust you as a reliable person to whom they can refer work from their clients and friends. Absentee members will not get work referred to them because they will not be seen as reliable. Indeed not honouring your fellow members with your presence on a regular basis is quite disrespectful. BNI has a strict attendance policy and members can be removed for more than a couple of absences in six months. Not everyone can be comfortable with that formula, but founder Ivan Misner said recently “there is a direct correlation between the quantity of referrals generated in a networking group and the absenteeism of a group. The higher the absenteeism, the lower the referrals. The lower the absenteeism, the higher the referrals.” My experience in referral networking leads me to agree with that wholeheartedly. Success in networking is about trust and reputation. I can refer another person only if I think they have a good reputation for reliability and therefore I need to know them well. If I refer them then my own reputation is on the line. It’s simple really. Be there! I remember when I was starting out in the workplace, I took a client file I had been working on to my immediate boss for review. I remember he picked on something I had done and asked about it. I don’t remember the detail but I do know that I said that I had made an assumption about an issue. I remember he boomed at me “Never assume! Always check your facts.” Of course he was quite right and it was a lesson I learned. In business there is another expression which can sound rather trite, which is that we don’t know what we don’t know. Of course this also applies to our general knowledge. There was a recent short series on BBC Television about the Lost Land of the Tiger which was about looking for and finding (Bengal) tigers in Bhutan, from the forest up into the high Himalayas. Now I had not ever thought much about whether there would be tigers in Bhutan, but watching the programmes I also learned that Bhutan had clouded leopards, golden cats, flying squirrels and more conventional (in my mind) spotted leopards. Now I had assumed I knew that flying squirrels were Australian marsupials and spotted leopards were only found in Africa. I suppose I had no basis for these assumptions, but I thought I knew these assumptions as facts. It turns out there are species of flying squirrel in many parts of the world. In business there is a great danger of stumbling alone and trying to deal with difficult issues and assuming we know just what to do, or that we know there is no solution to our problem. Most of us have done it. Usually there is help at hand if only we ask for it. We should never assume that we know all the answers, because no one does know all the answers. However, collectively there will be people who between them do know practically all the answers. We only have to ask our network and someone will be there to help. Our network is part of our business team. Apple Mac enthusiasts will have been disappointed that the Bhutan expedition did not film a snow leopard but only found the remains of a yak a snow leopard had half eaten. Just the same the series was a reminder to me not to assume anything which is outside my area of expertise. What do you think? Why the title? Well, some PR material you see on-line and off-line is quite discouraging to the prospective client or customer. Quite often I need to look at the websites of firms of accountants, who, though they may provide the some of the same sort of services as my own business, you will know that I regard as colleagues. We are all earning our keep and often co-operation is an advantage. I do shudder though when I see certain phrases. “We are the largest in Essex dealing with this subject”. Well, the firm in question has two offices. I would rather suggest the personal attention the client would have to ease their pain than plant in the mind of a prospect that they would be just one of many clients of a certain sort. On another accountants’ website is “we have moved into prestigious new offices in the High Street”. That just implies they are likely to be expensive. I don’t suppose they are and I congratulate them on their success, but I would recommend them to emphasise the value and savings they can deliver to their clients and not crow about the posh offices. There is another firm of accountants whose website home page has a photo of the partners standing knee-deep or more, depending on height, in a field of a mauve-flowered crop. One’s first reaction is “what are they doing?” I suppose they want to appeal to the farming community, being provincially based, but the photo damages the overall impression of what would be quite a nice website. I confess I had a giggle, which is a shame because I think they are a good firm. We all get things wrong. You could say about me “people in glasshouses…”. Go on, why don’t you? However, we do need to make sure that our offering is clear and valuable, and we do not have more than a few seconds of attention-span to get the message across. Have you seen any mixed messages from businesses recently? What’s in a name? I like to be able to relate to a business. I like to get a feeling for what it stands for and for the person behind it. I like any business to which I might give my custom to have a name which is easily remembered and which will slip of the tongue easily. Now, please don’t think I am getting at anybody, but names such as VXI Tree Surgeons or JKT Property Services I am unlikely to remember. Initials which stand for an established brand are easier to recall, but that is because we know what they stand for. Love it or hate it we know what to expect from KFC. I think big companies do get this wrong too. There is a very large bank called HSBC. It used not to be its name of course, but it started using those initials when it bought the Midland Bank and moved into domestic banking in the UK. 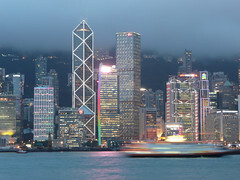 I started my working life with HSBC, but in those days it was called the Hongkong and Shanghai Banking Corporation. Of course for internal memos we used the initials HSBC, but we introduced ourselves as working for the Hongkong Bank. Incidentally, please note that Hongkong was always one word for the Bank, whereas spelling the dependency and now Chinese province was always two words. People might have been put off banking with an organisation from a a place which used to be known for making cheap plastic toys, of course, so I think something like Great Eastern Bank would have rolled off the tongue a lot better. Both Hong Kong and the bank have a far more illustrious history than cheap toys and I guess it was association that put them off, but a trick was missed I think. Still the holding company could still have been called Hongkong and Shanghai Banking Corporation. Anyway, rather than initials, proper names are important because they make businesses seem less faceless. Caspers Accountants is much better than C & S Accountants (I don’t know a Caspers who are accountants; I made it up) and it is easier to say Caspers than C & S when giving a recommendation. It is highly likely someone will forget a couple of initials within thirty seconds so any recommendation might be in vain. Another pitfall in a business name is using a town or district. A name like Assington Plumbing (Assington is a village in Suffolk) might suggest to a prospective customer that they don’t travel and are not worth phoning. It’s just bad psychology in my view. I think a small business should have a person’s name in it if it is a service business, and a shop should either have a name or a title which says exactly what it does, such as Smith’s Ironmongers. Only have a place or area if that is exactly the area you service. So Southend Logistics is a less good name for a transport company than East Anglian Logistics. Although I go along with Juliet in that a badly named company might provide as good a service or product as one that is easily remembered, it might just be a rose we would never smell. What do you think?